After a Southwest plane made an emergency landing in Philadelphia after an engine failed, one person was left dead. She was identified by the University of New Mexico Health Sciences Center as Jennifer Riordan. 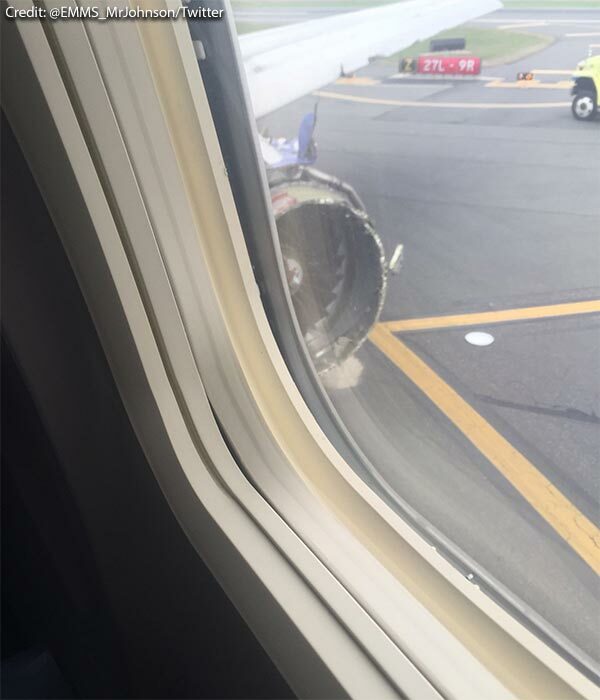 PHILADELPHIA -- A Southwest Airlines jet blew an engine at 32,000 feet and got hit by shrapnel that smashed a window, setting off a desperate scramble by passengers to save a woman from getting sucked out. One person died and seven others were injured. "Jennifer Riordan has passed away as a result of previously reported events on Southwest Airlines flight #1380. Jennifer's vibrancy, passion and love infused our community and reached across our country. Her impact on everything and everyone she touched can never be fully measured. But foremost, she is the bedrock of our family. She and Mike wrote a love story unlike any other. Her beauty and love is evident through her children. We are so appreciative of the outpouring of support from family, friends and our community. We do ask that those who seek to express their condolences and prayers as well as media outlets respect our privacy at this time. Our family and friends need this time to both grieve and celebrate Jennifer's impact on us all. In her memory--please remember to always be kind, loving, caring, and sharing." Passengers are calling the pilot of Southwest Airlines Flight 1380, which made an emergency landing Tuesday in Philadelphia, a hero. News of Riordan's death was first shared by the assistant principal of the Albuquerque Catholic school attended by her two children. In an email to parents, assistant principal Amy McCarty wrote that "the family needs all the prayers we can offer." Passengers dragged Riordan back in as the sudden decompression of the cabin pulled her part way through the opening. "I just remember holding my husband's hand, and we just prayed and prayed and prayed," said passenger Amanda Bourman, of New York. "And the thoughts that were going through my head, of course, were about my daughters, just wanting to see them again and give them a big hug so they wouldn't grow up without parents." National Transportation Safety Board chairman Robert Sumwalt says this was the first passenger fatality in an accident involving a U.S. airline since 2009. The NTSB sent a team of investigators. Sumwalt said the engine will be taken apart and examined to understand what caused the failure. Photos of the plane on the tarmac showed a missing window and a chunk gone from the left engine, including part of its cover. "She has nerves of steel. That lady, I applaud her," said Alfred Tumlinson, of Corpus Christi, Texas. "I'm going to send her a Christmas card, I'm going to tell you that, with a gift certificate for getting me on the ground. She was awesome." As you can imagine, passengers on Bay Area Southwest flights are nervous after one woman was killed in after a plane's engine blew out in mid-air. Bourman said she was asleep near the back when she heard a loud noise and oxygen masks dropped. She said the plane was fairly quiet because everyone was wearing a mask. "Everybody was crying and upset," she said. "You had a few passengers that were very strong, and they kept yelling to people, you know, 'It's OK! We're going to do this!'" In a recording of conversations between the cockpit and air traffic controllers, an unidentified crew member reported that there was a hole in the plane and that "someone went out." Tumlinson said a man in a cowboy hat rushed forward a few rows "to grab that lady to pull her back in. She was out of the plane. He couldn't do it by himself so another gentleman came over and helped to get her back in the plane and they got her." Another passenger, Eric Zilbert, an administrator with the California Education Department, said: "From her waist above, she was outside of the plane." Passengers struggled to plug the hole somehow while giving the badly injured woman CPR. Passengers did "some pretty amazing things under some pretty difficult circumstances," Philadelphia Fire Commissioner Adam Thiel said. "We were very lucky to have such a skilled pilot and crew to see us through it," Zilbert said. "The plane was steady as a rock after it happened. I didn't have any fearing that it was out of control." Southwest has about 700 planes, all of them 737s, including more than 500 737-700s like the one in Tuesday's accident. It is the world's largest operator of the 737. The 737 is the best-selling jetliner in the world and has a good safety record. The jet's CFM56-7B engines were made by CFM International, jointly owned by General Electric and Safran Aircraft Engines of France. CFM said in a statement that the CFM56-7B has had "an outstanding safety and reliability record" since its debut in 1997, powering more than 6,700 aircraft worldwide. RAW VIDEO: Southwest Airlines flight makes emergency landing on April 17, 2018. "There's a ring around the engine that's meant to contain the engine pieces when this happens," said John Goglia, a former NTSB member. "In this case it didn't. That's going to be a big focal point for the NTSB - why didn't (the ring) do its job?" Wells Fargo released a statement on Riordan saying: "The Wells Fargo family is saddened to learn of the death of our friend and colleague Jennifer Riordan - a Community Relations leader in Albuquerque, New Mexico. She was a well-known leader who was loved and respected. We extend our deepest sympathies to her family and friends. Out of respect for the family and their privacy, we've nothing more to share at this time." The NTSB released photos of officials inspecting damage to the plane around 5 p.m. Friday evening.